Low-level flying brought a number of serious problems as the Valiant's wing spar attachment castings showed premature fatiguing and inter-crystalline corrosion traced to the use of an inappropriate type of aluminium alloy. The Valiant had been the first of the V bombers to become operational, and its role was already shifting to that of a tanker. Rather than repair or rebuild the fleet, the Valiant was grounded and the Handley Page Victor took over the tanker role. In November 1944, the Joint Technical Warfare Committee, along with a separate committee chaired by Sir Henry Tizard, examined the future potential of "weapons of war" and the accompanying Tizard Report published on 3 July 1945 made specific policy directions for the Royal Air Force (RAF) Bomber Command. After the Second World War, the standing policy of using heavy bombers with four piston-engines for massed raids remained in force in the immediate postwar period, with the Avro Lincoln, an updated version of the Avro Lancaster, as its standard bomber. In 1946, the Air Staff issued Operational Requirements OR229 and OR230 for the development of turbojet-powered heavy bombers capable of carrying nuclear weapons at high altitude and speed, without defensive armament, to act as a deterrent particularly to a Soviet attack and, if deterrence failed, to perform a nuclear strike. In January 1947, the British Air Ministry issued Specification B.35/46 for an advanced jet bomber intended to carry nuclear weapons and fly near to the speed of sound at altitudes of 50,000 ft. Three firms: A.V. Roe, Handley-Page and Vickers-Armstrongs submitted advanced designs intended to meet the stringent requirements. While Short Brothers submitted a design that was judged too ambitious, the Air Staff accepted another submission from the company for a separate requirement, B.14/46, as "insurance" in case the advanced B.35/46 effort ran into trouble. Short's conservative design became the S.A.4 Sperrin. Two prototypes were completed, the first flying in 1951, but the type was relegated to research and development. While both Handley-Page and Avro came up with very advanced designs for the bomber competition. These would become the Victor and the Vulcan respectively, the Air Staff decided to award contracts to each company as a form of insurance in case one design failed. The submissions were known as V bombers, with all the aircraft names starting with the letter "V" and consequently, were known collectively as the V-class. Vickers' submission had initially been rejected as not as advanced as the Victor and Vulcan, but Vickers' chief designer George Edwards lobbied the Air Ministry on the basis that it would be available much sooner than the competition, going so far as to promise delivery of a prototype in 1951 and production aircraft in 1953. Although developing and putting into service three entirely different large aircraft in response to a single Operational Requirement (OR) was wasteful and very costly, the imperative of deterring Stalin's Soviet Union from aggression in Europe created a situation of urgency. In April 1948, the Air Staff issued a specification with the designation B.9/48 written around the Vickers design, which was given the company designation of Type 660. In February 1949, two prototypes of the aircraft were ordered. The first was to be fitted with four Rolls-Royce RA.3 Avon engines, while the second was to be fitted with four Armstrong Siddeley Sapphire engines as the Type 667. The first prototype took to the air on 18 May 1951, as George Edwards had promised, and beat the first Short Sperrin into the air by several months. It had been only 27 months since the contract had been issued. The pilot was Captain Joseph "Mutt" Summers, who had also been the original test pilot on the Supermarine Spitfire, and wanted to add another "first" to his record before he retired. His co-pilot on the first flight was Gabe "Jock" Bryce, who replaced Summers on his retirement. The Vickers Type 660 was given the official name of "Valiant" the next month, recycling the name from the Vickers Type 131 general-purpose biplane of 1931. The name Valiant was selected by a survey of Vickers employees. The Valiant jet bomber prototype was lost due to an in-flight fire in January 1952, all the crew escaping safely except for the co-pilot, who struck the tail after ejecting. After modifications to the fuel system (thought to be the cause of the fire), the second prototype, Vickers Type 667, first flew on 11 April 1952. It was fitted with RA.7 Avon engines with 7,500 lbf (33 kN) thrust each, rather than the Sapphires originally planned. The loss of the initial prototype did not seriously compromise the schedule, since the accident occurred late in the flight test programme. An initial order for 25 production Valiant B.1 (Bomber Mark 1) aircraft had already been placed in April 1951. The first production aircraft flew in December 1953, again more or less on the schedule Edwards had promised, and was delivered to the RAF in January 1955. Britain's "V-bomber" force, as it had been nicknamed in October 1952, was now in operation. The Victor and Vulcan would follow. The Valiant was a conservative design, with a shoulder-mounted wing and four Avon RA.3 turbojets, each of 6,500 lbf (29 kN) thrust, two in each wing root. The design gave an overall impression of a plain and clean aircraft with simple aerodynamics. George Edwards described it appropriately as an "unfunny" aircraft. The root chord thickness ratio was 12% and allowed the Avon engines to be within the wing rather than on pods as in the contemporary Boeing B-47. This "buried engine" fit contributed to the aircraft's aerodynamic cleanliness. However, it made engine access for maintenance and repair difficult and increased the risk that the failure of one engine would contribute to the failure of its pair due to flying debris such as turbine blades. It also increased the complexity of the design of the main spar which had to be routed round the engines. The Valiant wing had a "compound sweep" configuration, devised by Vickers aerodynamicist Elfyn Richards. It had a 45� angle of sweepback in the inner third of the wing, reducing to an angle of about 24� at the tips. This was because the thickness/chord ratio could be reduced closer to the tips, balancing this against the sweep reduction in postponement of Mach effects such as buffeting and drag rise. Limiting in-service speed was Mach 0.82 and a typical cruise of Mach 0.76 at heights up to 55,000 ft when light. A "clean" Valiant (one without underwing tanks) could climb straight to 50,000 ft after takeoff unless it had heavy stores in the large bomb bay.The tail surfaces were swept back, and the horizontal tailplane was mounted well up the vertical fin to keep it clear of the engines' exhaust. The wing loading was low by modern standards and the Valiant was fitted with double-slotted flaps for takeoff (20� flap) and landing (40� or full flap, about 60�). The aircraft featured tricycle landing gear, with twin-wheel nosegear and tandem-wheel main gear retracting outward into the wing. Most of the aircraft's systems were electric including flaps and undercarriage. Initial Valiant production aircraft had four Rolls-Royce Avon 201 turbojet engines, with 9,500 lbf (42 kN) thrust each. Trials were performed with two underwing de Havilland Sprite rocket booster engines; however these were deemed unnecessary due to the availability of more powerful Avon variants, as well as fear of accidents if one booster rocket failed on take-off, resulting in asymmetric thrust. The engine inlets were long rectangular slots in the first prototype, but later Valiants featured oval or "spectacle" shaped inlets to permit greater airflow for more powerful Avon engine variants. The jet exhausts emerged from fairings above the trailing edge of the wings. Water injection was fitted to some Valiants and increased takeoff thrust by about 1,000 lb (450 kg) per engine. Electrics were based on 128 volt direct current generators for functions requiring large amounts of electrical power and a 28 V DC system provided a controlling voltage for other systems and the actuators that initiated the 128 V functions. Backup batteries were a bank of 24 V units for the 28 V low-voltage system and 112 V batteries (28 V in series) for the 128 V system. The brakes and steering gear were hydraulic, however pumps were electrically driven. The flight controls consisted of two channels of power control with full manual back-up; flying in manual was allowed but limited. The Valiant was built around a massive backbone beam that supported the wing spars and the weight of bombs in the long bomb bay. The crew were contained in a pressurized "egg" and consisted of pilot, copilot, two navigators, and an electronics operator. Only the pilot and copilot had ejection seats. The other three crew members had to bail out of the crew door on the port side of the fuselage. The main structural components, spars and beams etc. were built with the zinc/magnesium/copper aluminium alloy designated as DTD683 in the U.K., which was problematic in the production of the Valiant. The aircraft was designed with a 'Safe-Life' strategy. This combination of 'Safe-Life' and DTD683 came to be viewed as a severe mistake. In 1956, a publication within the Journal of the Institute of Metals of a paper that condemned the material DTD683 as being unstable and capable of catastrophic failure while stressing the airframe close to its design limits. The 'Safe-Life' design strategy was dimissed by a Lockheed engineer in a talk given to the Royal Aeronautical Society in 1956, because it did not guarantee safety in a catastrophic failure. The Valiant B.1 could carry a single 10,000 lb (4,500 kg) nuclear weapon or up to 21 1,000 lb (450 kg) conventional bombs in its bomb bay. Large external fuel tanks under each wing with a capacity of 1,650 Imp gal (7,500 L), could be used to extend range. Of the three prototypes, two were Mark 1s and one was for a developed version, the Valiant B.2, designed for low level attack. As such it had a strengthened airframe to cope with the rougher ride at low level. The B.2 had a lengthened fuselage with a total length of 114 ft (34.8 m), in contrast to a length of 108 ft 3 in (33 m) for the Valiant B.1. The strengthened wing entailed changes to the main landing gear. Each main undercarriage leg had four wheels instead of two and it retracted backwards into fairings to the rear of the wings. Finished in a gloss black night operations paint scheme, it became known as the "Black Bomber". Its performance at low level was superior to that of the B.1, 655 mph (1,054 km/h) at sea level compared to 414 mph (666 km/h). The Air Ministry ordered 17 B.2s, including two prototypes and 15 operational aircraft, in April 1952. The prototype was completed, and flew for the first time in September 1953. However, although the Valiant B.2's low-level capabilities would later prove to be highly desirable, the B.2 program was cancelled in 1955. The B.2 prototype was used for tests for a few years, then incrementally destroyed by being used as a target for ground gunnery. Since the Valiant was part of an entirely new class of bombers for the RAF, 232 Operational Conversion Unit was established at RAF Gaydon. Valiants were originally assigned to the strategic nuclear bombing role, as were the Vulcan and Victor B.1s when they became operational. The first operational RAF unit to be equipped with the Valiant was 138 Squadron, located first at RAF Gaydon, later at RAF Wittering. At its peak, the Valiant equipped at least seven RAF squadrons. A Valiant B.1 (WZ366) of No 49 Squadron was the first RAF aircraft to drop a British operational atomic bomb when it performed a test drop of a down-rated Blue Danube weapon on Maralinga, South Australia, on 11 October 1956. On 15 May 1957, a 49 Squadron Valiant B(K).1 dropped the first British hydrogen bomb, the "Short Granite" (AKA "Green Granite Small"), over the Pacific as part of Operation Grapple. The test was largely a failure, as the measured yield was less than a third of the maximum expected and while achieving the desired thermonuclear explosion the device had failed to operate as intended. The first British hydrogen bomb that detonated as planned, "Grapple X Round A" (AKA "Round C1"), was dropped on 8 November 1957. The Grapple series of tests continued into 1958, and in April 1958 the "Grapple Y" bomb exploded with 10 times the yield of the original "Short Granite". Testing was finally terminated in November 1958, when the British government decided it would perform no more air-delivered nuclear tests. Peacetime practice involved the dropping of small practice bombs on instrumented bombing ranges, also a system of predicted bombing using radio tones to mark the position of bomb drop over non-range targets, the bomb error being calculated by a ground radar unit and passed either to the crew during flight or to a headquarters for analysis. When the Navigational and Bombing System (NBS) was fitted and crews well-trained, bombing accuracies became typical of other aircraft of the time and from high level (say, 40,000 ft/12,190 m) a 100 yd (90 m) error was not uncommon. The Valiant was the first of the V-bombers to see combat, during the Anglo-French-Israeli Suez intervention in October and November 1956. During Operation Musketeer, Valiants operating from the airfield at Luqa on Malta dropped conventional HE bombs on targets inside Egypt. Although the Egyptians did not oppose the attacks and there were no Valiant combat losses, the results of the raids were disappointing. Their primary targets were seven Egyptian airfields. Although the Valiants dropped a total of 842 tons (856 tonnes) of bombs, only three of the seven airfields were seriously damaged. It was the last time the V-bombers flew a war mission until Avro Vulcans bombed Port Stanley airfield in the Falkland Islands during the Falklands War in 1982. Valiant tankers were flown by 214 Squadron at RAF Marham, operational in 1958 and 90 Squadron at Honington, operational in 1959. These aircraft were fitted with a Hose Drum Unit (HDU or "Hoodoo") in the bomb bay. The HDU was mounted on bomb-mounting points and could be removed if necessary. However, this arrangement meant that the bomb doors had to be opened in order to give fuel to a receiver aircraft. With inflight refuelling probes fitted to Valiants, Vulcans and Victors and Valiant tankers available, the so-called "Medium Bomber Force" of the RAF could go beyond "medium range", and the RAF had a true strategic bombing capability. Long-range demonstration flights were made using Valiant tankers pre-deployed along the route. In 1960, a Valiant bomber flew non-stop from Marham in the UK to Singapore and in 1961 a Vulcan non-stop from the UK to Australia. The two tanker squadrons regularly practised long range missions, refuelled by other Valiant tankers on the way. In 1963 a squadron of Gloster Javelin All-weather interceptors was refuelled in stages from the UK to India, the tankers flying on to Butterworth near Penang in Malaysia (exercise "Shiksha"). Other aircraft refuelled at this time included Victor and Vulcan bombers and English Electric Lightning fighters, also the de Havilland Sea Vixen fighter of the Royal Navy. Valiants of No. 18 Squadron RAF at RAF Finningley were modified to the "radio countermeasures" (RCM) role - RCM is now called "electronic countermeasures" (ECM). These aircraft were ultimately fitted with APT-16A and ALT-7 jamming transmitters, Airborne Cigar and Carpet jammers, APR-4 and APR-9 "sniffing" receivers, and chaff dispensers. At least seven Valiants were configured to the RCM role. Valiants of number 543 Squadron at RAF Wyton were modified to serve in the photographic reconnaissance role. Originally the bombing role was at high level but with the shooting down of the Lockheed U-2 flown by Gary Powers by an early SA-2 Guideline missile, the SAM threat caused the V-force to train for low-level attack. They were repainted in grey/green camouflage, replacing their anti-flash white scheme. Three squadrons of Valiants were assigned to the low-level tactical bombing role (49, 148, 207) and two more squadrons (90 and 214) served as tankers. They also continued to serve in the strategic photo-reconnaissance role (543 Squadron). However, low-level operations proved too much for the Valiant. On 6 August 1964, there was a failure of a rear spar in WP217, an OCU aircraft from Gaydon flown by Flight Lieutenant "Taffy" Foreman. The aircraft landed back at Gaydon but without a flap because of damage in the rear of one wing. Later inspection of the aircraft showed the fuselage skin below the starboard inner plane had buckled, popping the rivets; the engine door had cracked and the rivets had been pulled and the skin buckled on the top surface of the mainplane between the two engines. Inspections of the entire fleet showed that the wing spars were suffering from fatigue at between 35% and 75% of the assessed safe fatigue life, probably due to low level turbulence. After this inspection, the aircraft were divided into three categories, Cat A aircraft continuing to fly, Cat B to fly to a repair base, and Cat C requiring repair before flying again. The tanker squadrons had the highest proportion of Cat A aircraft because their role had been mainly at high level. This also caused the methods of assessing fatigue lives to be reviewed. However, in early 1965, the Wilson government with Denis Healey as Secretary of State for Defence decided that the expense of the repairs could not be justified and the fleet was permanently grounded as of 26 January 1965. The QRA alert that had been in place for SACEUR was maintained until the final grounding and was then allowed to lapse. On 9 December 1964, the last Valiant tanker sortie involved XD812 refuelling Lightning aircraft over the North Sea. On the same day, the last Valiant bomber sortie was carried out, using XD818. 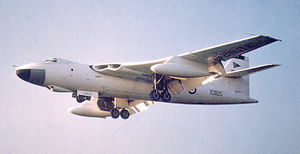 The Valiant was Vickers' last purpose-built military aircraft. It was followed by the Vanguard, a passenger turboprop designed in 1959 and flying into the 1990s, and the Vickers VC-10, a jet passenger aircraft from 1962, though the latter is used as a military transport and tanker for the RAF. Including three prototypes, a total of 107 Valiants were built. Valiant B.1: 39 pure bomber variants, including five pre-production Type 674, which were powered by Avon RA.14 engines with the same 9,500 lbf (42 kN) thrust each as the earlier Avon 201 and 34 Type 706 full-production aircraft, powered by Avon RA.28 204 or 205 engines with 10,500 lbf (47 kN) thrust each, longer tailpipes, and water-methanol injection for take-off boost power. Type 710 Valiant B(PR).1: eight bomber/photo-reconnaissance aircraft. Edwards and his team had considered use of the Valiant for photo-reconnaissance from the start, and this particular batch of aircraft could accommodate a removable "crate" in the bomb-bay, carrying up to eight narrow-view/high resolution cameras and four survey cameras. Type 758 Valiant B(K).1: 44 bomber / tanker aircraft. Both tanker variants carried a removable tanker system in the bomb-bay, featuring fuel tanks and a hose-and-drogue aerial refuelling system. A further 16 Valiant B(K).1s were ordered, but cancelled. Vickers also considered an air transport version of the Valiant, with a low-mounted wing, wingspan increased to 140 ft (42.7 m) from 114 ft 4 in (34.8 m), fuselage lengthened to 146 ft (44.5 m), and uprated engines. Work on a prototype, designated the Type 1000, began in early 1953. The prototype was to lead to a military transport version, the Type 1002, and a civilian transport version, the Type 1004 or VC.7. The Type 1000 prototype was almost complete when it, too, was cancelled. Valiant production ended in August 1957. Vickers Valiant B1 XD818 - RAF Museum Cosford, on display with the other two V bombers, the Victor and Vulcan in the Cold War Jets Collection, this is the only fully intact example in existence, and so is the only place where an example of all three V bombers can be seen together. Cockpit sections surviving comprise XD816 at Brooklands Museum in Surrey and XD875 at the Highland Aviation Museum at Inverness Airport. A third surviving section is the cockpit of XD826 which is part of a private collection in Essex and the flight deck of XD857 is displayed at the Norfolk & Suffolk Air Museum at Flixton, Suffolk. 12 January 1952; First Prototype WB210 Crashed near Hurn. 29 July 1955; Valiant B1 WP222 of No. 138 Squadron crashed on takeoff at RAF Wittering following aileron malfunction killing all four crew. 11 May 1956; Valiant B1 WP202 of the Royal Aircraft Establishment lost control and crashed attempting to land at Southwick Recreation Ground, near Hove in Sussex. 13 September 1957: Valiant B(PR)K1 WZ398 of No. 543 Squadron caught fire in a hangar at RAF Wyton, not repaired. 11 September 1959: Valiant BK1 XD869 of No. 214 Squadron flew into the ground after a night take off from RAF Marham. 12 August 1960: Valiant BK1 XD864 of No. 7 Squadron nose wheel failed to retract on takeoff from RAF Wittering, while sorting it out the aircraft stalled and crashed into the ground at Spanhoe disused airfield. 11 July 1961: Valiant B1 WP205 of the Aircraft and Armament Experimental Establishment overshot runway and hit control caravan at Boscombe Down. 3 November 1961: Valiant B(PR)K1 WZ399 of No. 543 Squadron abandoned takeoff at Offut AFB, Nebraska, United States, caught fire after overshooting runway onto a railway line. 6 May 1964: Valiant B1 WZ363 of No. 148 Squadron(although a 148 Sqn aircraft, it was on loan to, and crewed by, members of 207 Sqn) dived into the ground at night at Market Rasen, Lincolnshire. 23 May 1964: Valiant B(PR)K11 WZ396 of No. 543 Squadron landed on foam with landing gear problems at RAF Manston, not repaired. Andrews, C.F. The Vickers Vailant (Aircraft in profile no.66). Leatherhead, Surrey, UK: Profile Publications Ltd., 1965. Andrews, C.F. and Eric B. Morgan. Vickers Aircraft since 1908. London: Putnam, 1988. ISBN 0-85177-851-1. Brookes, Andrew. V-Force - The History of Britain's Airborne Deterrent. London: Jane's Publishing Company Ltd., 1982. ISBN 0-7106-0238-3. Burnet, Charles and Eric B. Morgan. "The V-Bombers: Vickers Valiant, Part 1." Aeroplane Monthly, Volume 8, No. 8, August 1980. Burnet, Charles and Eric B. Morgan. "The V-Bombers: Vickers Valiant, Part 2." Aeroplane Monthly, Volume 8, No. 9, September 1980. Downey, Bob. V Bombers (Warbirds Illustrated No. 35). London: Arms and Armour Press, 1985. ISBBN 0-85368-740-4. Gunston, Bill. Bombers of the West. London: Ian Allan Ltd., 1973, pp 38-53. ISBN 0-7110-0456-0. Jackson, Robert. Modern Combat Aircraft: 11 - V-Bombers. Shepperton, Surrey, UK: Ian Allan Ltd. ISBN 1-901945-03-0. Laming, Tim. V-Bombers: Vulcan, Victor and Valiant - Britain's Airborne Nuclear Deterrent. London: Patrick Stephens Limited, 1997. ISBN 978-1-85260-529-2. Morgan, Eric B. Vickers Valiant: The First V-Bomber. Leicester, UK: Midland Publishing, 2002. ISBN 1-85780-134-2. "Valiant: Last of the Vickers Bombers?" Flight, 4 July 1958, pp. 13-20. Rosemeyer, Maurice Patrick. Adventure in the Air: Memoirs of a Flight Test Engineer. London, Ontario, Canada: Insomniac Press, 2009. ISBN 1-92658-214-4. Turpin, Brian. "Database: Vickers Valiant." Aeroplane, Volume 30, No. 2, Issue 346, February 2002. Wynn, Humphrey. RAF Nuclear Deterrent Forces. London: The Stationery Office. 1996. ISBN 0-11-772833-0.